An exotic looking young girl wearing a mysterious costume, and a big hat poses for her portrait at an unknown studio. She is holding an open fan in a shielding manner. The young woman looks like she may be a teenager. Why is she dressed in this fashion? Is this her wardrobe for a play? Is she going to a costume ball? 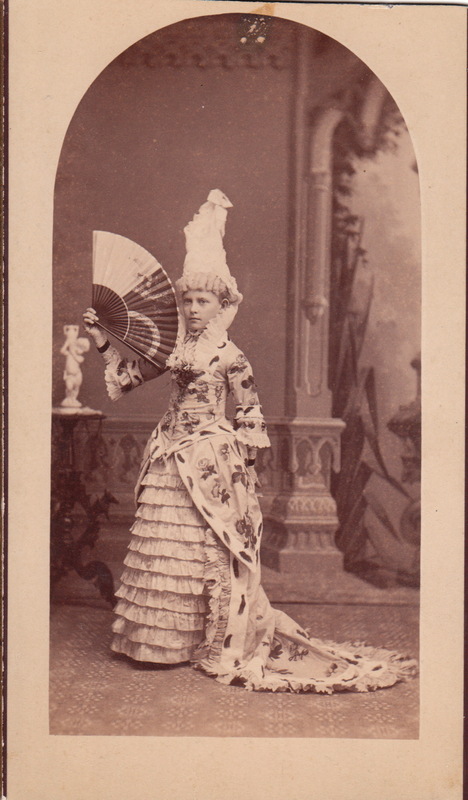 This image was likely produced in the early part of the cabinet card era and is probably of European origin. Two young women pose for their portrait in Newport, Pennsylvania. 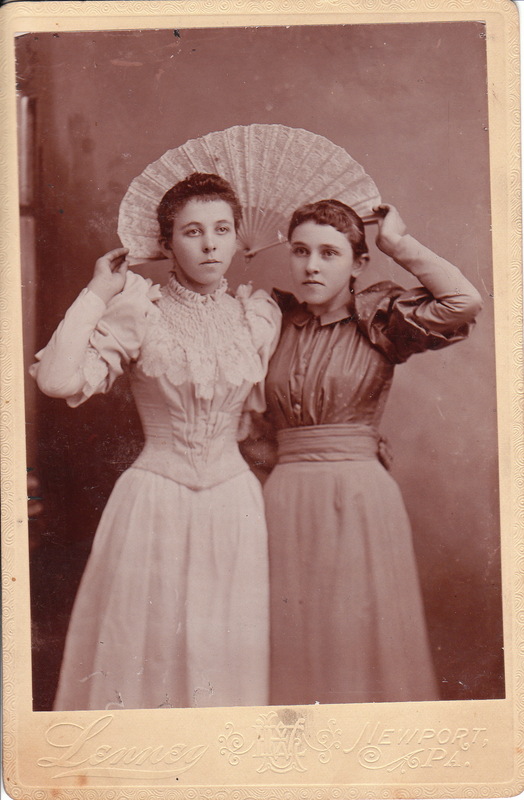 Both women are grasping one end of a fan that they hold behind their heads. Their raised arms highlight their hour glass figures which are given an assist by the corsets they are wearing. The photographer is named William Easter Lenney. He was located in Newport in the early 1890’s and moved to Atlanta, Georgia where he became a well known portrait photographer between 1894 and 1920. He and his family then moved to California. A pretty woman poses for photographer, Ivan Rigyitsky in Werschetz. Werschetz (German name) is a town in Serbia. It is known as Vrsac in Serbia. The town has been under the rule of several different governments over modern times. It was once part of Austria-Hungary. This image has some interesting features. 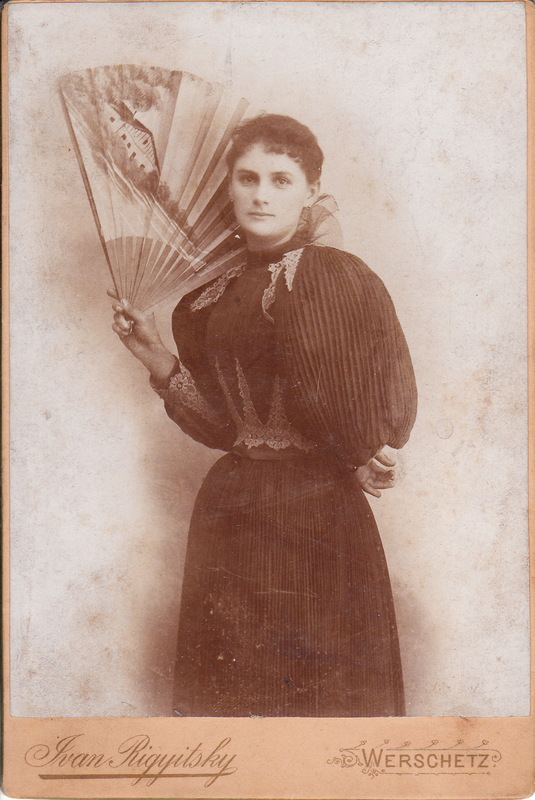 The woman is dressed very fashionably and she is holding an open beautiful fan. Note the lovely scene pictured on the fan. The young lady has a nice figure, with the help of a corset, no doubt. There certainly must be an interesting story related to this cabinet card photograph by Conklins Studio in Dowaglac, Michigan. 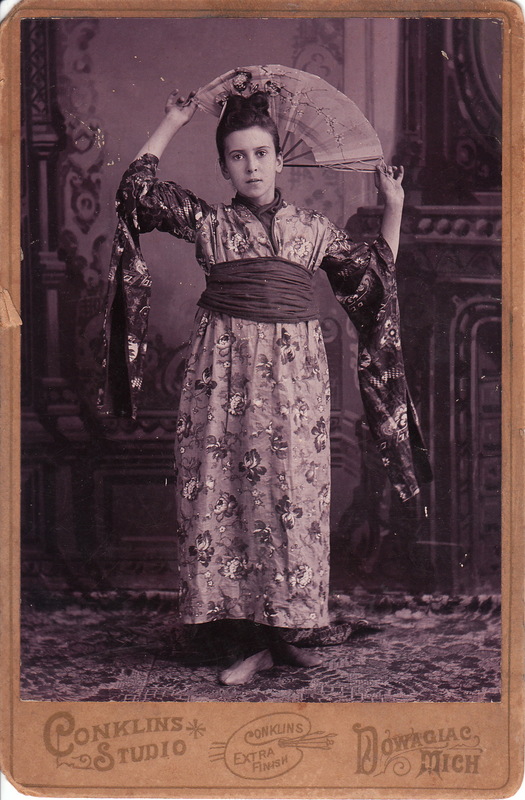 A girl, who appears to be an early teenager, poses for this photograph dressed in a beautiful kimono and holding an oriental fan. Where did she get such a terrific clothing? Did her she, or her parents travel to Japan to obtain these clothes? Was Asian fashion in vogue at the time of this photograph? Comments related to these questions are welcome. A couple poses for a photograph at the studio of Hardesty & Armstrong in Santa Ana, California. 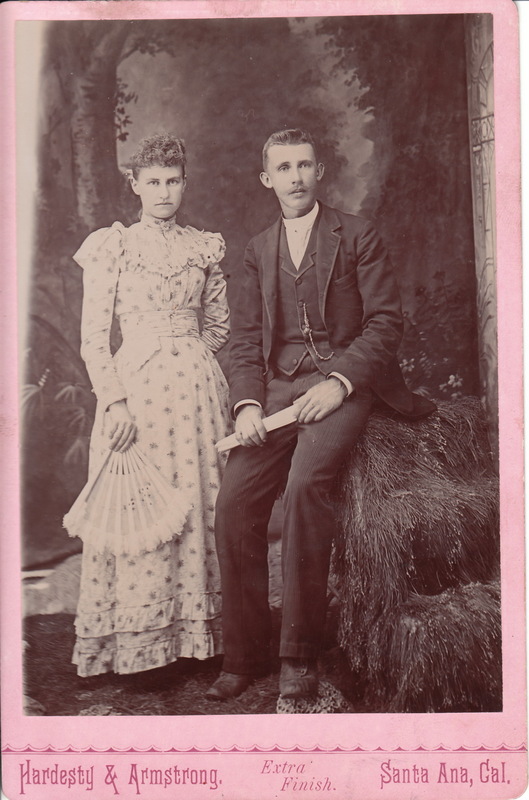 Both the man and woman in this cabinet card photograph look very unhappy. She looks particularly sour. The couple are nicely dressed; the woman is holding a fan and the man is holding a rolled piece of paper. Is he holding a wedding certificate for a wedding picture? Has he just graduated from a college? Is this a brother and sister? The answer is lost to history. Note the gentleman’s pocket watch.